At the Charleston law firm of Romano & Associates, PLLC, we take pride in our heritage as legal advocates for individuals, families and businesses. We are deeply committed to making a difference in the lives of our neighbors in the Kanawha, New and Greenbrier valleys of West Virginia. Whether you have suffered a personal injury, you have an employment dispute or your business requires tax law assistance, you can rely on us. We will be here for you when you need help the most. When you turn to us after a car accident, after workplace harassment or after another incident, we will take responsibility for all the legal details. You won't have to worry about dealing with insurance adjusters, medical billing departments and other parties. Let us lift your burden. Our mission is to listen, to care, to act and to efficiently resolve your legal concerns. Our team of attorneys and staff members are all West Virginia natives who are proud to live and work in this state. Our firm actively participates in community events and supports many local organizations. 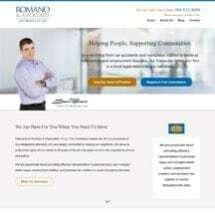 Learn more about Romano & Associates, PLLC, or schedule a consultation with one of our lawyers by contacting us today. We offer free case evaluations for all personal injury and employment law cases. We also make home and hospital visits for clients who are unable to visit our Charleston office. Flexible appointment times are available.